BTC Logistics Centre setting guidelines of smart logistics • BTC d.d. This year’s anniversary event reminded all the attendees of the roots of today’s BTC Company, reaching back to the 1950s. In 1954, the warehouse company Centralna skladišča was founded and later on renamed to company Javna skladišča. In 1975, this became the largest goods and transport centre in former Yugoslavia and was renamed to Blagovno-transportni center Ljubljana – BTC. Today, 63 years later, the BTC Logistics Centre is one of the business units of the dynamic, open, and advanced BTC Company, which builds its progressive business culture on innovativeness, social responsibility, sustainable development, and connecting. In 2016, the BTC Logistics Centre registered an almost 10 per cent income growth, a result of expanding business activities with existing clients and of acquiring new strategic partners. The growth of 8.6 per cent is planned for the year 2017. The growth potential is seen in connecting with other logistics professionals in the region. Due to the expansion of logistics services in 2017, an expansion of warehouse areas is also planned for the same year. 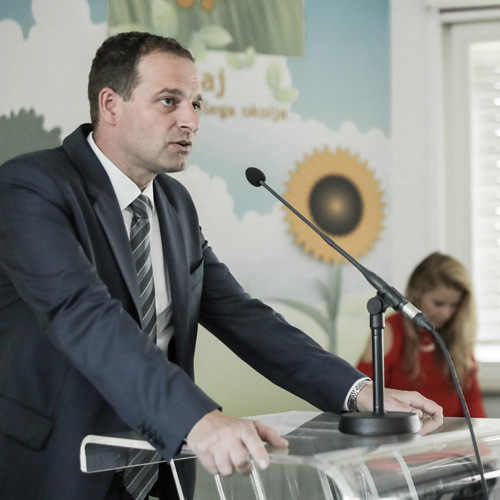 Playing an important role in this process is the establishment of the connecting warehouse in 2017 and the preparation for the establishment of the Intermodal Logistics Terminal Ljubljana. The main business objective of the BTC Logistics Centre is to maintain the position of the leading specialised provider of logistics services at home and the spreading of the already established model of logistics services into the region. The most important domestic and foreign business partners are Spar Slovenia, Podravka, Žito, Petrol, Atlantic trade, Wrigley, Dr. Oetker, Pernod Ricard, Prodis, British American Tobacco, Drogerie Markt, Rittal, and Beiersdorf. Closely connected to the updating of logistics processes in the scope of the BTC Logistics Centre is also the Logistics Competence Centre in which several renowned companies from the field of information technology and automation take part. This way, the BTC Logistics Centre is actively involved in developing the platform for managing information flows within the entire logistics chain. The Competence Centre is part of a broader platform called the Logistics City. The Logistics Centre, which seats the Slovenian Logistic Association and the Association of Societies of Drivers and Mechanics of Slovenia, has become the hub of logistics and transport knowledge in Slovenia, which connects business partners, professional establishments, and educational establishments. Within the Logistics City, new services are being developed to upgrade the importance of logistics in the entire supply chain.